Fas and Fas Ligand (FasL) are two molecules involved in the regulation of cell death. Their interaction leads to apoptosis of thymocytes that fail to rearrange correctly their T cell receptor (TCR) genes and of those that recognize self-antigens, a process called negative selection; moreover, Fas–FasL interaction leads to activation-induced cell death, a form of apoptosis induced by repeated TCR stimulation, responsible for the peripheral deletion of activated T cells. 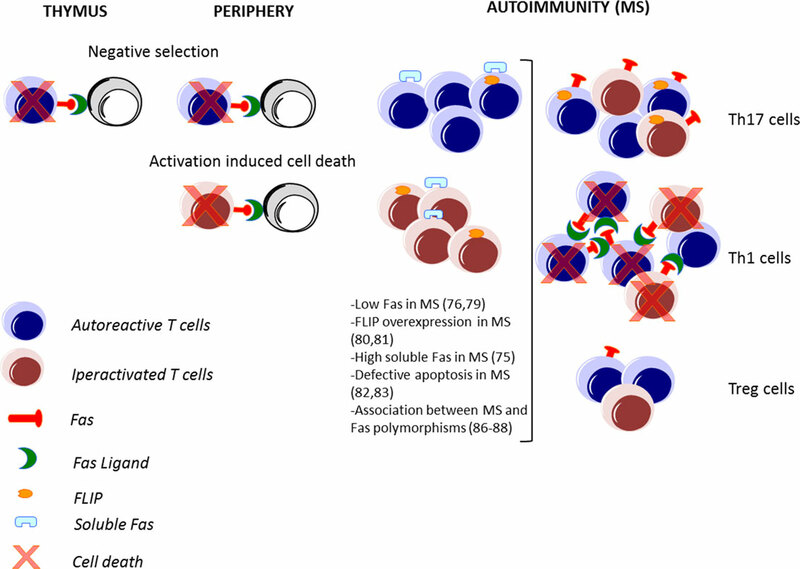 Both control mechanisms are particularly relevant in the context of autoimmune diseases, such as multiple sclerosis (MS), where T cells exert an immune response against self-antigens. This concept is well demonstrated by the development of autoimmune diseases in mice and humans with defects in Fas or FasL. In recent years, several new aspects of T cell functions in MS have been elucidated, such as the pathogenic role of T helper (Th) 17 cells and the protective role of T regulatory (Treg) cells. Thus, in this review, we summarize the role of the Fas–FasL pathway, with particular focus on its involvement in MS. We then discuss recent advances concerning the role of Fas–FasL in regulating Th17 and Treg cells’ functions, in the context of MS.
Fas and Fas Ligand (FasL) are members of the tumor necrosis factor (TNF)-receptor and TNF family, respectively. The ligation of Fas with FasL results in the activation of a caspase cascade that initiates apoptosis (1–5). Apoptosis mediated by Fas–FasL is an important mechanism for the maintenance of immune homeostasis. During a physiological immune response, programed cell death (apoptosis) has the important role to delete potentially pathogenic autoreactive lymphocytes from the circulation and tissues, limiting tissue damage inevitably caused by immune responses (6). In fact, T cell receptor (TCR) restimulation of previously activated and expanded T cells in the absence of appropriate co-stimulation induces activation-induced cell death (AICD) (7–9), an important mechanism for removal of overly activated T cells, such as autoreactive T cells in autoimmune diseases. Multiple sclerosis (MS) is an autoimmune disease characterized by the accumulation of CD4 and CD8 T cells in the central nervous system (CNS) compartment (10, 11). CD8 T cells expand clonally and by targeting specific antigens they are accountable for oligodendrocyte loss, demyelination, and neuronal damage. Although CD4 T cell responses have less substantial clonal features than CD8 T cells, they do expand and accumulate in the brain (10, 12) where they play a critical role in inflammation and in priming CD8 and B cells. The control of the potentially limitless expansion of these cells is achieved also by Fas–FasL-mediated apoptosis, and its therapeutic enhancement could be useful to reduce pathogenic T cells in MS.
Fas (also called CD95 or APO-1 or TNFRSF6) is a type I transmembrane protein (2), containing a death domain (DD) in its cytoplasmic region, which is essential for the induction of apoptosis (13). The induction of apoptosis is triggered by the interaction of Fas with its ligand (FasL), a 40-kDa membrane protein (14) allowing recruitment of the adaptor protein Fas-associated death domain (FADD) (15) and binding of procaspase-8, resulting in the formation of the death-inducing signaling complex (DISC) (16, 17), which finally leads to the activation of effector caspase-3 by active Caspase-8 (Figure 1). Figure 1. Schematic representation of the Fas–FasL pathway. 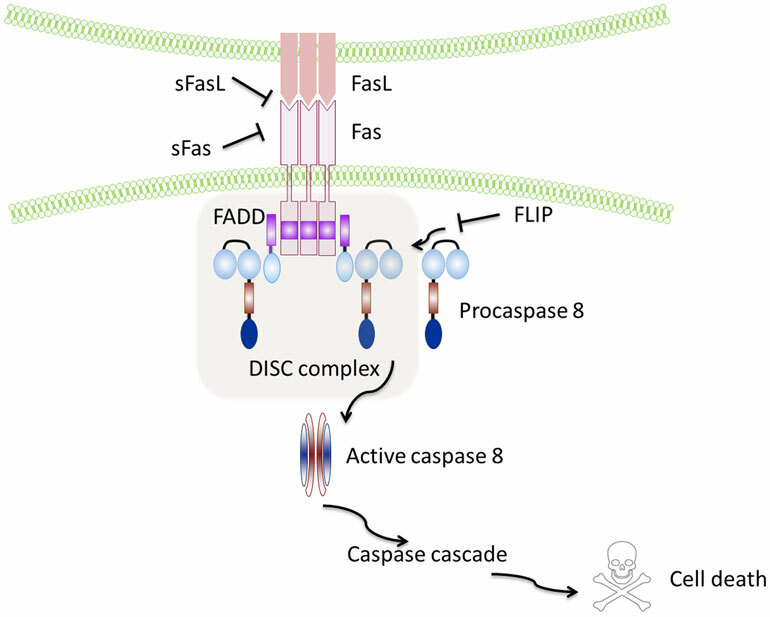 Binding of the Fas leads to recruitment and activation by the protein adaptor FADD of procaspase-8 and formation of the death-inducing signalling complex (DISC). Active caspase-8 directly cleaves caspase-3 and initiates the caspase cascade, which ultimately leads to cell death. Soluble Fas and soluble FasL bind to the respective ligands inhibiting activation of the pathway. FLIP inhibits activation of caspase-8 and is thus a major anti-apoptotic protein. The membrane-bound form (mFasL) can be cleaved from the cell surface by metalloproteinases to produce a truncated soluble product (sFasL) of 26 kDa derived from the extracellular domain (14). In the mouse, sFasL can also be generated by alternative splicing (18). However, it is not clear what triggers sFasL release, but it is plausible that abnormal or excessive activation of T cells causes the production of sFasL, with deleterious systemic effects. However, sFasL does not activate Fas, and it competes with mFasL reducing its cytotoxic activity (19, 20). This is due to the fact that sFasL binds Fas, but it is unable to induce its oligomerization, thus preventing activation of the proapoptotic signaling pathway by mFasL (21–23) (Figure 1). Similar to FasL, a membrane and soluble isoform with opposite functions have also been described for Fas: the isoform skipped of exon 6, that encodes the transmembrane region, leads to the synthesis of an mRNA that codes for a soluble form of the receptor known to repress apoptosis (24, 25), and the Ewing sarcoma protein (EWS), which has been recently described as responsible for the Fas splicing event (26). Notably, the anti-apoptotic protein caspase-8 (FLICE)-like inhibitory protein (FLIP) is another potent inhibitor of Fas signaling that may block Fas-mediated apoptosis by disturbing the formation of the DISC (27) (Figure 1). The activation of the Fas–FasL pathway is finely regulated by several mechanisms, including formation of Fas microclusters (21, 28–31), actin reorganization (31), inducible or constitutive association with membrane rafts (32–36), and acid sphingomyelinase-mediated ceramide production (37). Moreover, another important mechanism of regulation of cell death mediated by Fas–FasL is the transcriptional control of FasL gene expression. Indeed, while Fas is ubiquitously expressed in a variety of tissues and with particular abundance in the thymus, liver, and kidney (38), FasL expression is controlled by specific protein-DNA interactions at the FasL promoter. Several factors have been identified, which regulate FasL gene expression, such as specificity protein-1 (Sp1); Ets-1 (the homolog of viral Ets); interferon regulatory factor (IRF) 1 and 2; inducible cAMP early repressor (ICER); nuclear factor in activated T cells (NFAT); nuclear factor-kappa B (NF-kB); activator protein-1 (AP-1); early growth factor (EGR) 1, 2, and 3; and c-Myc (KAVURMA). Moreover, the modulation of these transcription factors is strictly dependent on environmental cues, including cytotoxic stress, DNA-damaging agents, and interleukin (IL)-2, which promote FasL expression, IL-6, transforming growth factor-beta (TGF-β), retinoic acid, nitric oxide, and Vitamin D3 that repress FasL expression (39). The Fas–FasL-mediated death plays a major role in immune homeostasis: it is required for the deletion of autoreactive lymphocytes during the immune system’s development (negative selection); this process is defined as central tolerance in the thymus (40) and peripheral tolerance in the periphery (41), and it is also required for the control of the number of lymphocytes activated during an immune response against a pathogen, leading to the contraction of the ongoing immune response (42) (Figure 2). Figure 2. Fas–FasL-mediated T cell death in immune response and in MS. The Fas–FasL pathways are not only involved in deletion of autoreactive lymphocytes during the immune system’s development in the thymus and in the periphery (negative selection) but also in the deletion of lymphocytes activated during an immune response (activation-induced cell death). In autoimmune disorders, such as multiple sclerosis (MS), alteration of these processes may lead to a defective deletion and an accumulation of autoreactive and activated T cells. Pathogenic T helper (Th) 1 and Th17 cells are abundant in MS, while protective T regulatory (Treg) cells are less frequent. Moreover, high expression of FasL in Th1, high expression of FLIP by Th17 cells, and low expression of Fas by Tregs lead to a differential cell death sensitivity by Th1, Th17, and Treg cells. Moreover, the Fas–FasL pathway is required not only for death of T cells (43) but also for deletion of autoreactive B cells (44, 45), B cell somatic hypermutation (46), cytotoxicity of NK and CD8 T cells (47, 48), apoptosis of endothelial cells (49), regulation of myeloid suppressor cells’ turnover (50), and activation of macrophages’ functions against infections (51). The Fas–FasL interaction was also described as an important mechanism leading to immune privilege in specialized tissues, such as the CNS, eye, testis, ovary, pregnant uterus, and placenta, through the induction of apoptosis in infiltrating inflammatory cells (52–54). However, the CNS is no longer considered an immune privileged site in a strict sense and indeed immune cells, especially T cells can be detected in the CNS under normal conditions (55, 56). In this view, the only element protecting the CNS from immune-mediated attacks is the presence of an intact blood–brain barrier (BBB) and the absence of an immune-competent population of tissue macrophages/tissue dendritic cells. Therefore, the expression of FasL by microvascular endothelial cells and astrocytic foot processes, major constituents of the BBB, favors an immune-suppressive environment within the CNS (57). Given the crucial role of the Fas–FasL pathway in regulating the balance between cell survival and cell death, it is also implicated in the protection from transplant rejection, tumors, and autoimmunity. The discovery that mice defective in Fas or FasL develop a lymphoproliferation phenotype (lpr) or a generalized-lymphoproliferative-disease phenotype (gld) (1, 5, 58), definitely associated the Fas–FasL pathway to pathology. In humans, patients with mutations in the DD of Fas (Canale–Smith syndrome or autoimmune lymphoproliferative syndrome) have increased numbers of circulating double-negative T cells (>20%), lymphadenopathy, and signs of autoimmunity, such as hemolytic anemia, thrombocytopenia (59), and expansion of autoantibody-secreting plasma cells (46). However, given the multiple roles of Fas–FasL in immune responses and diseases, therapeutic targeting of the Fas/FasL pathway might not only fail to protect against a specific disease but could also potentially affect the behavior of different cell targets thus influencing the outcome for the patient. For instance, in tumors, activation of Fas has antagonistic effects: it can lead to tumor apoptosis (60–62) or to tumor cell survival (63, 64). Indeed, although Fas activation can lead to the killing of tumor cells, it can also lead to apoptosis of infiltrating lymphocytes. In this context, there are several evidences that show that the constitutive expression of FasL by tumor cells can be used as a mechanism of immune evasion (65) by directly leading to apoptosis of infiltrating Fas positive lymphocytes (66, 67). It is becoming clear that a potential therapy targeting the Fas–FasL pathway in disease should consider the direct targeting of the pathogenic cells for specific diseases, such as tumor cells for cancer and immune cells for autoimmunity. Multiple sclerosis is an autoimmune disease of the CNS characterized by demyelination and axon damage caused by infiltration of inflammatory cells, including autoreactive lymphocytes and macrophages (68). The first evidence for a role of Fas–FasL system in MS stems from the observation that Fas and FasL are expressed in brain lesions of MS patients. In particular, FasL is expressed by astrocytes, oligodendrocytes, and macrophages, while Fas is mainly expressed by macrophages, T cells, and oligodendrocytes (69, 70). Several studies have addressed the role of the Fas–FasL system in experimental autoimmune encephalomyelitis (EAE), the murine model of MS (71–75). Mice carrying mutations in Fas (lpr) or FasL (gld) generally show a milder disease course, despite persistence of immune cell infiltrates into the CNS. Fas expression by neural cells, particularly oligodendrocytes, seems to be important for disease progression, and lpr mice show fewer cells undergoing apoptosis in the CNS (74); on the other hand, lack of FasL on pathogenic lymphocytes transferred for the induction of EAE determines attenuated (71, 75) and monophasic (72) disease. Moreover, FasL-deficient mice develop prolonged signs of EAE when immunized with wild-type autoreactive T cells, indicating that in autoreactive T cells, the Fas–FasL system plays a regulatory role during the recovery from EAE. Thus, the Fas–FasL pathway is involved in the development and/or progression of autoimmunity in the CNS. Further studies investigating the role of the Fas–FasL system in MS have been performed in human samples through the analysis of peripheral blood cells, serum, and cerebrospinal fluid (CSF) from MS patients. Serum levels of soluble Fas are significantly elevated in patients with relapsing remitting MS (76), indicating that it could contribute to inhibit apoptosis in this disease. Consistent with these results, it has been reported that Fas transcript is decreased in the active phase of MS patients (77), and Fas expression on the surface of CD4+ CCR5+ T cells, a T cell subset implicated in MS (78, 79), is decreased in MS patients compared to healthy donors (HD) (80). Moreover, the inhibitor protein FLIP is overexpressed in intrathecal and blood lymphocytes from MS patients (81, 82). These results suggest that the Fas–FasL pathway is affected in MS, and this phenomenon could lead to defective cell death and thus to increased survival of pathogenic cells. This hypothesis was confirmed by functional studies that revealed a defective sensitivity to apoptosis of blood T cells derived from MS patients compared to cells from HD (83, 84). In contrast, it is not clear whether FasL expression is increased or decreased in activated peripheral blood mononuclear cells from MS patients compared to HD, as reported by two studies describing conflicting results (85, 86). However, studies on peripheral blood mononuclear cells should focus on distinct cell subsets rather than on the bulk population of lymphocytes, particularly when the cells of interest are present at low frequency. Failing to do so may explain the reported discordant results on levels of FasL expression, since comparative studies between individuals may be affected by differential representation of functionally distinct subsets. Differential expression of Fas and FasL could also be a result of a differential genetic regulation in MS and HD. However, genetic studies consistently demonstrate only a weak association between MS and Fas polymorphisms (87–89). The T cell population includes a variety of T cell subsets. In recent years, two subsets emerged as particularly relevant in MS disease: T helper (Th) 17 that produce IL-17 (90–92) and T regulatory (Treg) cells that suppress the functions of effector T cells (93). In particular, the increased expression of IL-17 produced by Th17 cells has been associated with MS (94), and its inhibition or deletion in the corresponding animal model has provided varying degrees of protection (95). In contrast, Treg cells are present at lower frequency in patients with MS and are defective in their suppressor functions in vitro (96, 97). Indeed, there is a functional antagonism between Th17 and Treg cells, and the increase of Th17 cells and a decrease of Treg cells observed in MS patients compared to HD indicate an important role of the Th17/Treg balance in the modulation of MS disease. Thus, the impact of the Fas–FasL system could differentially regulate MS disease, depending on the T cell target (Figure 2). Several studies have demonstrated that murine Th17 cells are more resistant to AICD than another Th subset called Th1, characterized by predominant and abundant interferon (IFN)-γ production (98–100). Th1 cells have a pathogenic role in MS (101), particularly in the initiation of the inflammatory response, through the activation of macrophages (102) and the induction of increased vascular adherence that facilitates access in the CNS of the critical effector cells sustaining tissue damage, such as Th17 cells (103). Interestingly, differential cell death sensitivity between Th1 and Th17 cells is also confirmed in cells derived from MS patients (100). Since the homeostatic regulation of cell expansion by cell death is similar in HD and MS patients, the persistence of Th17 cells in MS disease may be due to altered mechanisms of Th17 cell generation in MS patients compared to HD. Thus, this process could be responsible for the impaired apoptotic deletion of polyclonal and myelin-specific T cells derived from MS patients’ blood (83). In fact, the impaired apoptotic deletion observed in MS could be related to the higher frequency of apoptosis-resistant cell subsets in MS compared to HD (104). Similar to Th17 cells, Th1/17 (coproducing IL-17 and IFN-γ) cells resist to AICD, suggesting that this mechanism could also be responsible for the persistence of cells producing both IL-17 and IFN-γ, emerging as potentially relevant in the pathogenesis of MS (105). Interestingly, low FasL and FLIP expression in Th17 cells compared to Th1 cells are the major mechanisms regulating their differential cell death sensitivity (98–100) (Figure 2). Recently, it has been demonstrated that low levels of mitogen-activated protein kinases (MAPKs), such as Erk1/2 and p38α, upon TCR stimulation, alter FasL expression and AICD sensitivity of Th17 cells (106). In MS, the involvement of FasL has been largely investigated in several studies as mentioned above, but contrasting results have been reported (85, 86). Thus, the differences in Th subset representation reported in those studies may explain the discordant results on the level of FasL expression in total lymphocytes from HD and MS patients. The lack of expression of FasL by Th17 and Th1/17 cells suggests that where generation of IL-17-producing cells is favored or increased, as in MS, accumulation of FasL negative cells in inflammatory sites may preclude interactions with FasL expressing cells, determining an escape from homeostatic containment. Another important source of IL-17 in MS is the CD161+ CD8+ T cell population, called mucosal-associated invariant T (MAIT) cells, which have been recently identified also within MS lesions (107, 108). There are evidences showing that these cells resist to cell death induced by chemotherapy due to the high levels of the multidrug receptor ABCB1 (also called P-gp, MDR1, and PGY1), which can rapidly efflux xenobiotics (109). MAIT cells express high levels of Fas (108), indicating their potential susceptibility to Fas-mediated cell death. However, investigations on the functionality of Fas–FasL pathways in these cells need to be performed. Fas–FasL is also involved in the regulation of cells known to have a protective role in MS, such as Treg cells (96, 97). In particular, apoptosis mediates homeostasis of Treg cells and Treg cell-mediated suppression (110). Treg cells with a CD4+ CD25high Forkhead box P3 (Foxp3)+ phenotype include a distinct subset of lymphocytes programed in the thymus (called naturally occurring Tregs) and adaptive Treg cells generated from naive CD4 T cells in the periphery (111). The study of the expression of surface molecules involved in apoptosis revealed that FasL is expressed at low levels in human and murine Treg cells upon stimulation (112), and that Fas is present at particularly low levels in a small subset of Tregs expressing CD45RA, a hallmark of resting/naive T cells (113, 114), which are thus resistant to apoptosis induced by exogenous Fas stimulation (115) (Figure 2). However, these cells are sensitive to FasL-induced apoptosis in the absence of TCR stimulation (116). In the site of inflammation, the sensitivity to apoptosis of Treg cells is modulated by several factors, including proliferation, cytokine environment, and antigenic stimulation (110, 117). For instance, activation-associated proliferation renders T effector cells more susceptible to AICD than Treg cells; IL-2 promotes AICD through the induction of FasL expression in activated T effector cells but does not sensitize Treg cells to AICD (117); TGF-β produced by Treg cells protects them from apoptotic death (118); and TCR engagement and CD3 cross-linking induce cell death in T effector cells and not in Treg cells (116). The different expression patterns of Fas and FasL of Treg cells compared to conventional effector lymphocytes might be due to regulation by Foxp3, the master transcription factor of Treg cells, which negatively regulates AICD and FasL expression. Indeed, in human Treg cells, knockdown of Foxp3 partially rescues FasL expression and AICD, and in mouse, Foxp3-mutant Treg cells from Scurfy mice express FasL at levels similar to those of conventional T cells (112). Interestingly, a genome-wide screen for Foxp3 target genes revealed a binding of Foxp3 in proximity to the FasL gene, but its direct interaction remains to be determined (119, 120). The Fas–FasL pathway in Treg cells obtained from MS patients has never been investigated; however, in another human chronic inflammatory disease, acute coronary syndrome, an alteration in the Fas/FasL pathway in Treg cells was described: here, in fact, Treg but not Th17 cells are sensitive to Fas-mediated apoptosis, and this could determine an imbalance between these two subsets, favoring inflammation (120). It was also shown that Treg cells infiltrating the inflamed liver express high levels of Fas and are particularly susceptible to apoptosis, consistent with the observed Treg dysfunction in inflamed tissues. Further studies are expected to shed light on the susceptibility of Treg cells to apoptosis in distinct disease models, to better understand how the experimental conditions affect their susceptibility to apoptosis, and to establish potential differences between thymic and adaptative Treg cells. The Fas–FasL pathway regulates cell death of several cell types, and given the broad expression of this pathway, it is important to define the specific role of each cell type in specific diseases. In particular, Fas–FasL regulates T cell functions and certainly contributes to diseases where T cells play a major role, as MS. However, several T cell subsets have been described, and in MS, they may have antagonistic roles: Th17 play a pathogenic role, while Treg cells exert a protective role by suppressing pathogenic effector T cells. The low FasL expression in Th17 cells indicates that these cells have evolved a mechanism to escape the programed cell death and to persist in inflamed sites. FasL is expressed at low levels also by Treg cells, possibly to enable their prolonged survival necessary to dampen immune reactions once the inflammatory stimulus has subsided. Consequently, an intriguing challenge for reducing inflammatory responses in MS would be to find a strategy to simultaneously induce specific cell killing of Th17 cells and to potentiate cell survival of protective Treg cells. EV organized the different sections of the manuscript and wrote the manuscript; MS wrote the section on T regulatory cells; LB critically reviewed the manuscript for important intellectual content; and GB coordinated author contributions and finalized the manuscript for submission. All authors approved the final version. The authors have been supported by grants from FISM-Fondazione Italiana Sclerosi Multipla (cod.2010/R/40 and cod. 2013/R/2) and by Italian Ministry of Health, Italy (RF-2011-02346771 and RF-2011-02347228). 14. Tanaka M, Suda T, Takahashi T, Nagata S. Expression of the functional soluble form of human fas ligand in activated lymphocytes. EMBO J (1995) 14(6):1129–35. 18. Ayroldi E, D’Adamio F, Zollo O, Agostini M, Moraca R, Cannarile L, et al. Cloning and expression of a short Fas ligand: a new alternatively spliced product of the mouse Fas ligand gene. Blood (1999) 94(10):3456–67. 25. Cascino I, Fiucci G, Papoff G, Ruberti G. Three functional soluble forms of the human apoptosis-inducing Fas molecule are produced by alternative splicing. J Immunol (1995) 154(6):2706–13. 28. Kischkel FC, Hellbardt S, Behrmann I, Germer M, Pawlita M, Krammer PH, et al. Cytotoxicity-dependent APO-1 (Fas/CD95)-associated proteins form a death-inducing signaling complex (DISC) with the receptor. EMBO J (1995) 14(22):5579–88. 30. Ruiz-Ruiz C, Robledo G, Font J, Izquierdo M, Lopez-Rivas A. Protein kinase C inhibits CD95 (Fas/APO-1)-mediated apoptosis by at least two different mechanisms in Jurkat T cells. J Immunol (1999) 163(9):4737–46. 67. Bennett MW, O’Connell J, O’Sullivan GC, Brady C, Roche D, Collins JK, et al. The Fas counterattack in vivo: apoptotic depletion of tumor-infiltrating lymphocytes associated with Fas ligand expression by human esophageal carcinoma. J Immunol (1998) 160(11):5669–75. 71. Dittel BN, Merchant RM, Janeway CA Jr. Evidence for Fas-dependent and Fas-independent mechanisms in the pathogenesis of experimental autoimmune encephalomyelitis. J Immunol (1999) 162(11):6392–400. 73. Sabelko KA, Kelly KA, Nahm MH, Cross AH, Russell JH. Fas and Fas ligand enhance the pathogenesis of experimental allergic encephalomyelitis, but are not essential for immune privilege in the central nervous system. J Immunol (1997) 159(7):3096–9. 74. Waldner H, Sobel RA, Howard E, Kuchroo VK. Fas- and FasL-deficient mice are resistant to induction of autoimmune encephalomyelitis. J Immunol (1997) 159(7):3100–3. 120. Li Q, Wang Y, Wang Y, Zhou Q, Chen K, Wang YM, et al. Distinct different sensitivity of Treg and Th17 cells to Fas-mediated apoptosis signaling in patients with acute coronary syndrome. Int J Clin Exp Pathol (2013) 6(2):297–307. Copyright: © 2016 Volpe, Sambucci, Battistini and Borsellino. This is an open-access article distributed under the terms of the Creative Commons Attribution License (CC BY). The use, distribution or reproduction in other forums is permitted, provided the original author(s) or licensor are credited and that the original publication in this journal is cited, in accordance with accepted academic practice. No use, distribution or reproduction is permitted which does not comply with these terms.